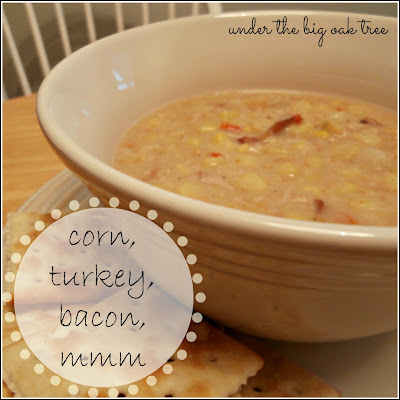 I can't remember where I first had my first taste of Chicken Corn Chowder. It could have been at a local deli when I first started working at the flower shop oh-too-many years ago to count. Or, it could have been on a day trip to Lancaster, PA when I first started dating my hubby. Either way, I was hooked ever since! While the trips to Lancaster didn't happen too often, I could always count on the deli to serve up my favorite chowder at least once (sometimes twice) a month. Soon, that wasn't enough to satisfy me! I decided I'd try to make it myself. Someday. Looking through my trusty Better Homes & Gardens Cookbook, I was excited to find there was a recipe for corn chowder without the chicken. Of course, I had to have the chicken, so I always added it near the end of the cooking time. 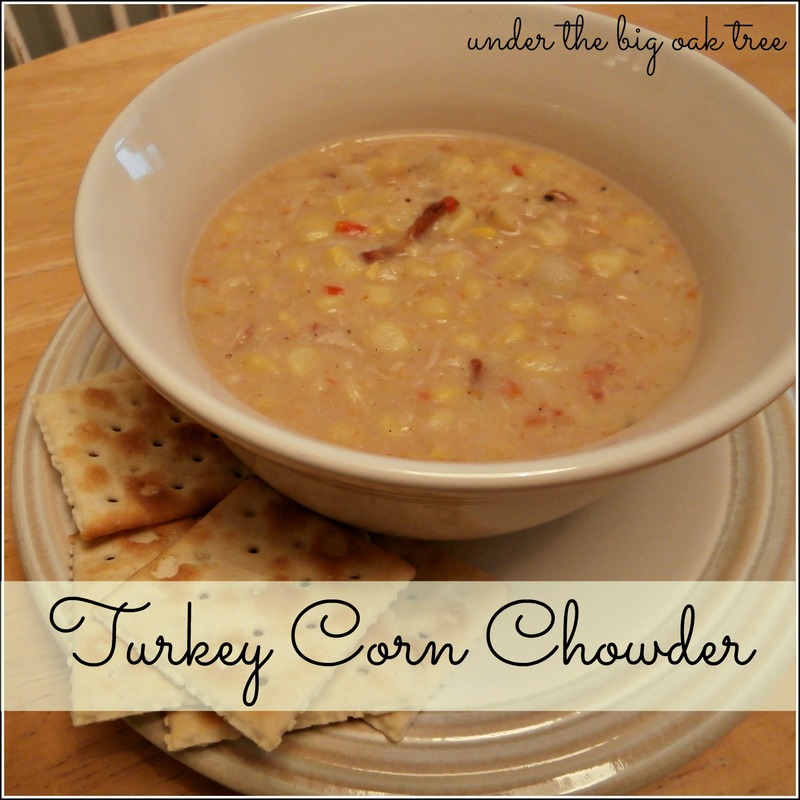 A few other small changes led us to our favorite Chicken Corn Chowder recipe...or in today's case, Turkey Corn Chowder! In a dutch oven, cook diced bacon until crisp. When bacon is done, remove from pot with a slotted spoon. Drain all but 1 Tbs. bacon grease from pot. Add the onions and peppers to the hot oil in the dutch oven, cook until tender. Stir in broth, potato and corn. Reduce heat, cover and simmer for 10 minutes (until potatoes are tender). In a small bowl or glass, mix together the flour and milk. Once well combined, stir into the chowder. Season to taste with the salt, pepper and crushed red pepper flakes while allowing to cook uncovered until thick and bubbly. If desired, use an immersion blender to lightly puree the chowder to desired texture. Once chowder is thick and bubbly, allow to cook for one minute longer before serving. You could easily use bacon leftover from the morning's breakfast or from the BLTs you enjoyed for lunch, just be sure to reserve some of the grease to cook your veggies. It brings that wonderful smokey, bacon flavor throughout the entire pot of soup! I make corn chowder several different ways, but this recipe has continued to be our favorite even after all these years!